Hurricane Sandy has come and gone, leaving devastation as a “thanks for having me” parting gift. My entire town has no power. Massive trees lay heavily across streets, strung with power lines like a Christmas tree. Schools are closed… indefinitely. We’ve spent the last three days, hunkering down in our basement, then in our living room where we are lucky enough to have a gas fire place. The house is cold. Internet and phones are out. Cell power is almost non-existent, although sometimes if you found just the right spot and stood with one arm out and your neck strained in the right direction while squatting low, you might, might just get service for maybe a minute. There’s no warm food or water, and my three boys are jumping all over each other in pent up energy, yet… It’s kind of nice. In our daily lives, we just do as we do. There’s a schedule filled with homework, play dates, sports and school, and now, there’s nothing. Just me, my husband and kids. There’s no Wi-Fi or texting. No phone calls or work. We have one crank radio, that I bought years ago for “just in case” as our only outside contact. We walk around the neighborhood as a family. We visit friends and neighbors and help out anyone if we can. One friend has a generator for charging phones and such, another needs a ride because they’re blocked in, someone needs bread, we all need a little time for our kids to play. We do what we can. It’s our own small disaster, and we’re in it together. They’re saying it’s going to be possibly two weeks or more before power may be restored. Right now, it’s quiet. People are walking the streets looking around in awe, snapping pictures. There are three restaurants in town, using generators to pump out food. Yesterday, we sat in the semi-dark enjoying a nice pizza at a local joint, while at the deli that was open, people waited congenially and patiently in line for hot coffee. It’s amazing to see, and, there’s a strange sense of appreciating the inconvenience. We’re all okay. Cars and houses were destroyed. The town is in some upheaval. But we’re all okay. Another day passed into night, our third, and we once again huddled in the cold, dark waiting for morning. Every five minutes, Howard would crank the radio and we’d listen to the real disaster in Breezy Point and Long Beach and Lower Manhattan. My back was cramped and my body a bit twisted since we were on a futon mattress on our living room floor in front of our fire place. But, cuddling my babies close in the security of my home, certainly felt like a luxury. So now I write from my in-laws home in Brooklyn. 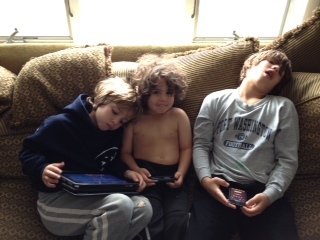 I’m back on the computer and my boys are back hooked up to their games. We have power, heat and hot water, all which certainly feels like a luxury as well, yet, I kind of miss the ‘we’re in it together’ huddle bubble. Oh well, maybe I’ll just take a nice, steaming hot shower to console myself. 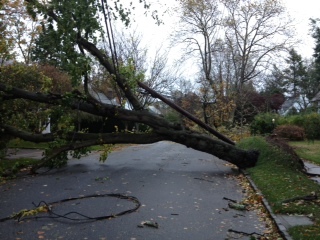 Posted in Uncategorized and tagged Hurricane Sandy, No Power, Power down, power outtage. Bookmark the permalink. My whole town in NJ is without power too and it’s looking like at least two weeks. Not even any of the businesses are powered yet and certainly no homes. We were lucky we put in a generator this past summer. We lost power for 8 days last Oct in the snowstorm. It was freezing. I agree, the togetherness in front of the fire was nice for a couple of days but then it got old! Good luck! Thinking about you since I saw that first pic of the tree down on your block before the storm really even hit. I keep telling people to come west, I have a big house in Indiana! Truly incredible. I can’t imagine. I’m so glad you are safe. I can only imagine the mix of emotions you’ve been through this week – fear, terror, relief, etc. I tell myself I’d really enjoy hunker-down time with my kids and husband. Or else I’m just romanticizing that scenario! I’m relieved you’re all safe and am happy to know your top-notch writing skills are intact! We too have been without power but do have a generator that we run some each day. The gas lines are scary though! I agree, its been great to see how everyone has come together during this! a little crazy. i’m ready to go back to my old boring life. Exactly how I felt. We just got our power back last night ( btw please feel free to come by and use anything in the house or do your writing:) and even though I loved the heat I kind of missed playing UNO by candlelight and sleeping all together in one room. Interesting what happens when we lose our creature comforts. Great essay. 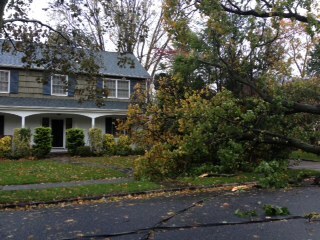 So glad that tree missed your house! thank you!!! at my mother’s now. i feel like the power is coming closer, so i’m hopeful… soon – please – soon!! Glad you’re all safe and sound. Great blog. So glad you have good neighbors and family. Praying you get power back asap! What’s the voting situation there? thank you. and it’s a mess!! SO glad that tree missed you guys!!!! Hope you get power back soon. me too!! it’s getting crazy! You put it all so well. That, to me, was the silver lining to Sandy as well. Spending that unplugged time with my family – even if we got a little edgy at times – knowing we were safe and together, talking, laughing and singing karaoke with the radio on Saturday night. it was so nice to have to slow down… and appreciate each other a little. but now, it’s been a week and a half.. i’m ready to move on. ha.